What does the term "action" mean in poker? What is the definition of the term "action" in poker? 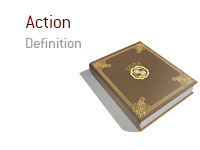 In poker, the term "action" can mean different things, depending on the context in which the word is used. To start, "action" can mean that it's somebody's turn to act. For instance, let's say that Phil Ivey and Daniel Negreanu are playing in a heads-up NLHE cash game. After a flop, Daniel Negrenau leads out with a bet, which means that the "action" is now on Phil Ivey, which means that he must either fold, call or raise. Ivey must perform some action in order for the hand to continue. An "action" includes folding, calling or raising. All of these are actions that players can perform. Another instance when the term "action" is used in poker? Let's say that you want to play somebody in a $25,000 NLHE heads-up match. This will take place at your semi-regular home game. You ask your playing companions, "Does anybody want any action?" In reality, you are asking your playing companions, "Do anybody want to take the other side of this bet?"